Compact Fluorescent Light « Global Market Insights, Inc.
As the lighting industry progresses from incandescent bulbs to CFLs and LEDs, smart lighting market has made its way as the next trending vertical. The vast expanse of this sphere can be aptly demonstrated by an incidence that occurred in Toronto a couple of years ago. A newly constructed building that nearly became a feather in the crown for the Toronto financial district, the EY Tower, made it to the headlines for offering IP addressable LED lights that tenants can control with internet-based building automation. The instance of EY Tower is of particular interest to the smart lighting industry as it demonstrates the steady presence of one of the most important forces, the real estate sector, into the smart cosmos. In order to lure tenants with modern technology and convince them to pay premium rents, other prominent real estate developers around the world have also followed the strategy adopted by the Canadian builders of EY Tower. One such instance is the retrofitting of the Torre Europa with Power over Ethernet (PoE) lighting. In the project that has been undertaken by Philips and Cisco, 14 floors will be equipped with 5,400 PoE luminaires. Advocates of such retrofitting of buildings with smart lighting technologies have pointed out the twofold advantage of the undertaking. It drastically reduces the cost of new wiring by virtually eliminating the need for certified electricians. This is because the low voltages that are capable of driving LEDs can travel safely over Ethernet and do not require the more-costly processes associated with installing conventional 120 Volt and 240 Volt electrical wires. The chief attraction of using smart lighting in buildings however, lies in the fact that connecting luminaires directly into information networks makes it possible to control the ‘switch on and off’, color temperature, brightness and hues via gadgets and sensors. It also turns lights into nodes that can trigger other operations such as adjusting the heating, and that can collect data about building use and assets. PoE is one of several technologies emerging to make lighting a crucial part of the Internet of Things (IoT). The novelty of the technology and the ease with which it can be controlled even remotely has majorly propelled smart lighting industry trends. The energy efficiency that smart lighting systems can afford is a major factor driving smart lighting industry size. In 2016, in the UN Climate Change Conference, Philips Lighting demonstrated how smart energy solutions work and can make a real difference to climate change. The event showcased the profoundly transforming capabilities of the smart lighting market, including demonstrations that depicted the energy and greenhouse gas saving potential of this one single technology. Indeed, the technology is equipped with the potential to reduce energy demand from lighting by half. Philips also exhibited that increasing the rate of energy efficiency to 3% can unlock significant economic benefits – close to 6 million new jobs can be created by 2020, fuel costs can be reduced by €2300 billion by 2030 and household energy bills be reduced by one-third. These estimates are evidence enough to testify the robust latitude of smart lighting industry. With the rapid proliferation of smart cities, smart lighting market is bound to become one of the most remunerative verticals for investors to pour their money in. Netherlands in this case, can be quoted as a bright example of the onslaught of smart cities, as even the smallest of towns in this country have deployed smart lights which can detect motion and switch themselves on and off. Larger cities like Rotterdam and Amsterdam have already installed smart lights on the streets that are not only energy efficient, but also add a swanky edge to the town or city that can make it more lucrative for growth and investments. As the number of smart city projects across the globe increase, providers of smart lighting for city streets are diversifying their services by turning smart street lighting poles into a potential hub for free Wi-Fi, or to sense the quality of air and even to notify police about public aggression or accidents. This shifting focus is more than likely to expedite smart lighting industry outlook in the ensuing years. One of the simplest drivers that can be credited for the superb projection of smart lighting market is the eagerness of consumers to upgrade to the latest technology. Currently, smart lights are being designed to be controlled with a smartphone or with AI personal assistants such as Siri or Alexa. In consequence, they have become infinitely more attractive to a generation of consumers who not only have the available disposable income to afford smart lighting but also want to own smart homes where the lighting can be controlled with a voice command. 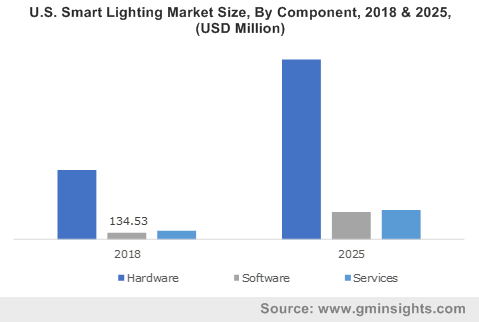 With the popularity of smart lighting on the rise in both the industrial and residential sectors, smart lighting industry size is projected to register a remarkable 20% CAGR over 2018-2024. This entry was posted in Sustainable & Smart Technologies and tagged Ballasts, Bluetooth, Bridges. Tunnels, CFL, Commercial, Compact Fluorescent Light, Component, DALI, Digital Addressable Lighting Interface, Dimmers, EnOcean, European Smart Lighting Market, Fixtures, Fluorescent Lamp, Gateways, Global Smart Lighting Market, HID, High Intensity Discharge Lamp, Highways, Hybrid, Indoor Lighting, Industrial, LED, LED Driver, Light Control, Lighting Source, Luminaires, Outdoor Lighting, PLC, PoE, Power Line Control, Power over Ethernet, Product, Public Places, Relays, Residential, Roadways, Router, Sensors, Smart Bulbs, Smart Lighting Market, Smart Lighting Market Forecast, Smart Lighting Market Report, Smart Lighting Market Share, Smart Lighting Market Trends, Switches, Technology, Wi-Fi, Wired, Wireless, Zigbee.